Every once in awhile while driving the back roads, one comes across a scene that captures the essence of a family farm. I think this is one such scene. It shows an active family farm in full bloom. The great light in the late afternoon helps the cows and the pasture pop against the multi colored sky. One of these shots makes all the other miles with little to show worthwhile. This entry was posted in Uncategorized and tagged afternoon sun, agriculture, barn, buildings, copyright ryan ware, cows, pasture, silo. Bookmark the permalink. You’re right. 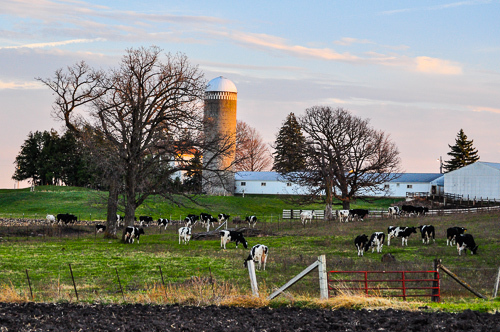 This shot brings back great memories of growing up on a dairy farm. Beautiful light.